A popcorn station for your wedding will give your guests a delicious pick-me-up before dinner. You can also have the station as a late night snack that doubles up as a gourmet favor. There’s so much fun to be had here, just think of the different flavor combinations that you can choose from! 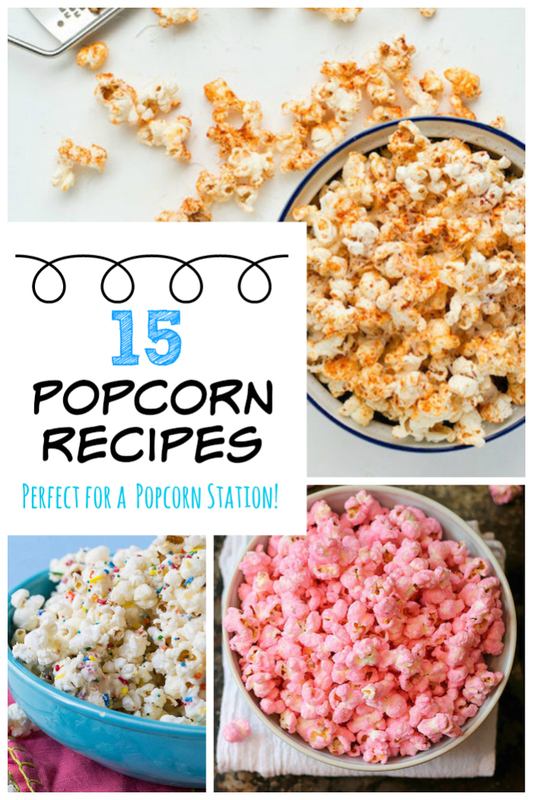 We’ve made things a bit easier for you, with 15 sweet and savory popcorn recipes. When your guests are starting to crave that second slice of wedding cake, they can help themselves to some cake batter popcorn. With white chocolate, cake mix and sprinkles galore, this recipe by Spicy Southern Kitchen will certainly be a crowd pleaser. Is there anything not to like in this decadent popcorn recipe from Ambitious Kitchen? For chocolate, peanut butter and bacon fans, this is a lovely treat to be included in a popcorn station. Cait’s Plate’s recipe is a quick and easy one, ideal for keeping your guests going during the day. This churro popcorn recipe from Oh Sweet Basil is a ridiculously good idea and a mess free way to indulge in some churro deliciousness. The gorgeous color of this popcorn recipe by Domestic Dreamboat will add a little brightness to your popcorn station. The Pretty Bee’s recipe ensures that your vegan guests and those with nut allergies have something yummy to munch on. If you’re looking for a twist on a sweet popcorn, Veggies By Candlelight’s recipe adds chili powder and nutmeg to the mix. Combine an after dinner drink with a late night snack with this recipe by The Seasonal Veg Head. Calling all bacon lovers! This bacon salt popcorn recipe from Young Austinian is perfect for when you’re craving something savory. Your guests will thank you for this bitesize alternative to chili cheese fries from Chocolate Moosey, at your popcorn station. This zingy and healthy recipe from Kasey’s Kitchen is a light option to include, especially if your other popcorn flavors are quite intense. This popcorn recipe by RecipeTin Eats is packed full of flavor and cheese, also known as an instant winner. For heat seekers and food trend followers alike, this Kittenhood recipe is a must-have. Wasabi and ginger are a great flavor combo and this popcorn recipe from The Wanderlust Kitchen is both spicy and salty. Yum! If you’re having a variety of flavors in your station, this recipe by Jennifer Medhurst is a subtle palate cleanser.